Speculation over plans for new public rooms on Habbo has been rife for months, especially because several doorways in the Hallways are empty. One public room which had been absent for a few months is the Theatre(dome), but as of today the room is in full swing! Habbo has had many public rooms over the years, from the Rooftop Cafe, to Habburgers and the iconic Welcome Lounge, which has been redesigned several times. However, one thing that hasn’t changed is the type of Habbos you find in these rooms. In this article I will give you a brief guide to what personalities and attitudes you can expect to come across whilst exploring these areas! Habbo has definitely given me an upper hand that normally I wouldn’t really give credit to. Ever since I could remember with Habbo, I was designing and building rooms and organising the furniture to where I saw fit, but not once did I ever think of pursuing a career involving it. If you have ever walked into a Habbo room and been blown away because of how detailed it was, and how they used just the right furniture to complete it then you’ll know what I mean. That is what drew me to exploring new rooms, and meeting new faces. It didn’t become apparent to me that I, too, could design rooms and have that creative touch until I started investing time into those small intricate rooms where even a single furni could either make or break the room. I began building an eye for design which brings me where I am today; I want to enroll in an interior designing class. I’ve come to a conclusion that no matter where life brings me in this world, I can admit to having some influence from Habbo on what I’d like to do in the future. I may not end up becoming a professional interior designer, but I bet it will help bring me to a place where I will advance my knowledge and understanding about my career. Has Habbo influenced your life in any way that may have encouraged what you wanted to do as a career? Let me know! 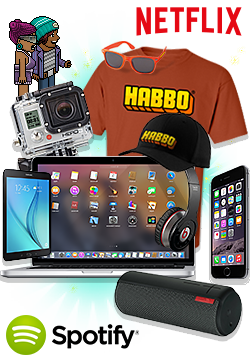 To be in with a chance of winning all you have to do is take a photo using the Habbo camera and submit it!